So the trend of fairytale/alternative-history action movies finally gets into full-swing after the success of the downright awful, Abraham Lincoln: Vampire Hunter. Now it is the turn of the Brothers Grimm’s tale of German-folklore, Hansel & Gretel, to receive the big screen action makeover. 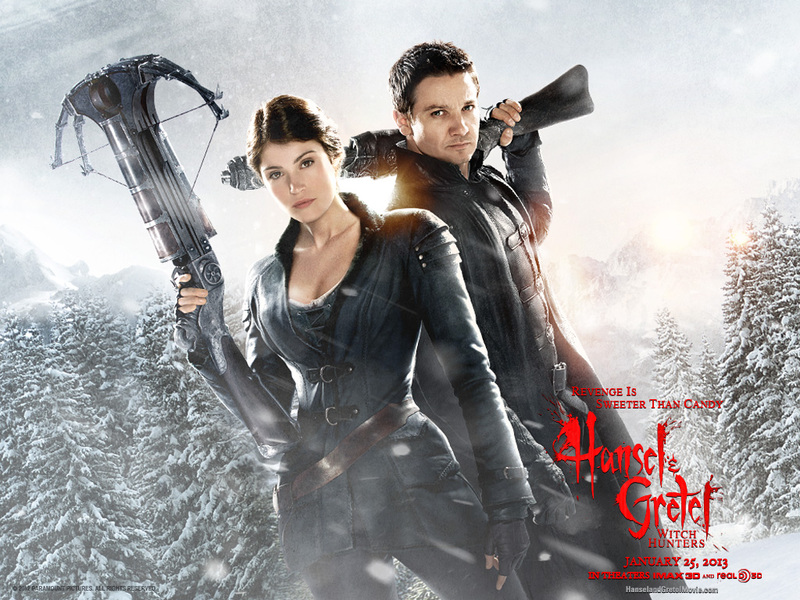 After being abandoned in the woods by their parents, Hansel & Gretel (Jeremy Renner & Gemma Arterton) are attacked by a vicious witch. For the rest of their lives the vow to become witch hunters and rid the world of these evil ladies. Fortunately, Hansel and Gretel: Witch Hunters is a vast improvement on Abraham Lincoln: Vampire Hunter, purely because it refuses to take itself too seriously. Tommy Wirkola’s film seems to pride itself on its trashy, over the top premise which results in a fun viewing experience. Wirkola has a clear competence when it comes to action sequences, with their being enough humour, suspense and gore to keep genre fans reasonably well entertained. A film like this simply needs to embraced for what it is, trashy fun – sequences involving witches being blasted away by Gatling guns ensure that this standard is met. There are occasional moments where the 3D shines – most notably in the titles and final sequences. However, for the most part viewers are likely to forget that it is there as it is not utilised particularly well. One would be best advised to seek out a 2D version of the film. As this is essentially a glorified B-Movie, the usual issues are prevalent. This mainly comes in the form of some horrifically bad dialogue – one sequence which sees a central character dying is met by Hansel’s line of “You did good.” It is unlikely to leave you in emotional peril, but it does provide some unexpected laughs. Other unintentional laughs appear through a bizarre relationship between Gretel and Edward, a friendly troll, where you could cut the sexual tension with a knife. Arterton and Renner do not get much opportunity to showcase any sense of dramatic ability, but they do lead the film solidly and are convincing action heroes with a likeable screen presence. In the tradition of the B-Movie, the focus is more on Arterton’s bosom or Renner’s chest than their acting talents. Supporting players Famke Janssen and Peter Stormare bring the most fun with their campy, over-performed appearances – both respectively proving big scene stealers. Hansel & Gretel: Witch Hunters is a glorified B-Movie and a perfectly entertaining one. Those looking for any dramatic substance stay away (but you knew that already), however if in the mood to see Jeremy Renner and Gemma Arterton kill witches in explosions of gore – this is the film for you.